It is already clear that litigation regarding climate damages has begun and is set to grow. The International Criminal Court has recently announced its intention to commence hearings in this regard. Legal judgements will come to depend more and more on a global methdology of climate truth and reconciliation for future INDC calculation consistent with UNFCCC-Compliance. 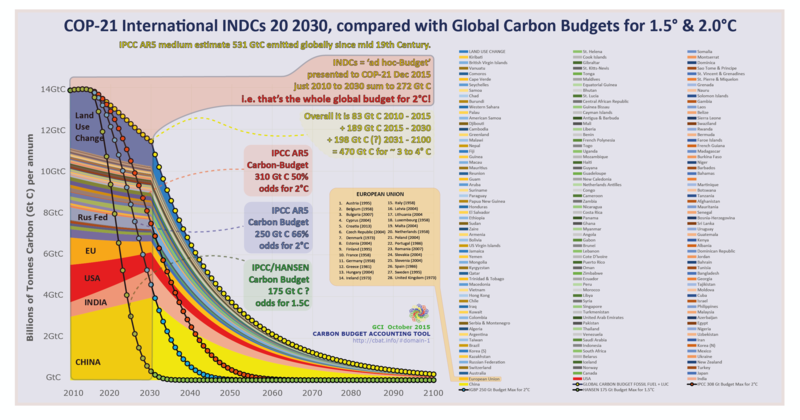 Chart One - INDCs for COP-21 International INDCs 2010-2030, as quantitatively interpreted by GCI, compared with Global Carbon Budgets for 1.5° & 2.0°C (50% & 66% odds; IPCC AR5). 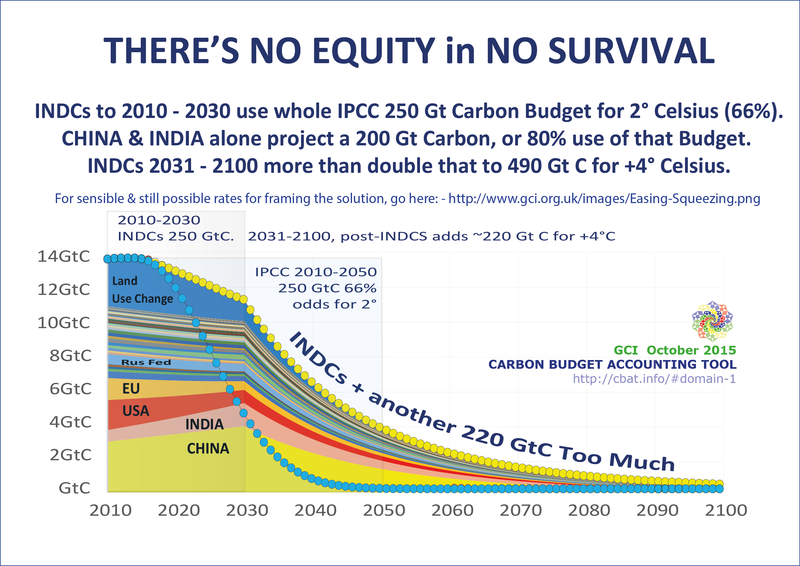 Chart Three - COP-21 The “25 year Emergency Transition” zero emissions & 100% Renewables by 2050 - STAR SCENARIO IPCC Budget 66% odds for 2°C Pro Rata emissions shares internationally after 2015. 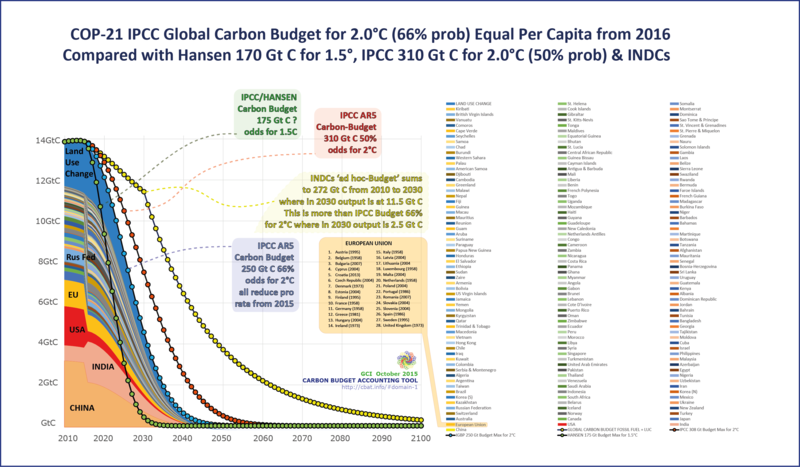 Chart Four - COP-21 The “25 year Emergency Transition” zero emissions & 100% Renewables by 2050 - STAR SCENARIO IPCC Budget 66% odds for 2°C Equal per capita emissions shares internationally after 2015. Chart Five IPCC Budget 66% odds for 2°C Equal per capita emissions shares internationally after 2015. The key is to get emissions down and replace the energy generation and use quickly. Chart Six IPCC Budget 66% odds for 2°C Equal per capita emissions shares internationally after 2015. The key is to get emissions down and replace the energy generation and use quickly. INDCs to 2010 - 2030 use whole IPCC 250 Gt Carbon Budget for 2° Celsius (66%). CHINA & INDIA alone project a 200 Gt Carbon, or 80% use of that Budget. INDCs 2031 - 2100 more than double that to 490 Gt C for +4° Celsius.